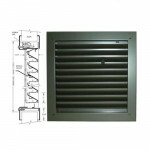 The Air Louvers 800A1 is a 12” x 12” Bronze Louver with non-vision inverted “Y” blades. Fa.. The Air Louvers 800A1 is a 16” x 12” Bronze Louver with non-vision inverted “Y” blades. Fa.. The Air Louvers 800A1 is an 18” x 12” Bronze Louver with non-vision inverted “Y” blades. F.. The Air Louvers 800A1 is an 18” x 18” Bronze Louver with non-vision inverted “Y” blades. F.. The Air Louvers 800A1 is an 18” x 24” Bronze Louver with non-vision inverted “Y” blades. F.. The Air Louvers 800A1 is an 18” x 60” Bronze Louver with non-vision inverted “Y” blades. F.. The Air Louvers 800A1 is a 24” x 12” Bronze Louver with non-vision inverted “Y” blades. Fa.. The Air Louvers 800A1 is a 24” x 18” Bronze Louver with non-vision inverted “Y” blades. Fa.. The Air Louvers 800A1 is a 24” x 24” Bronze Louver with non-vision inverted “Y” blades. Fa.. The Air Louvers 800A1 is a 24” x 60” Bronze Louver with non-vision inverted “Y” blades. Fa.. The Air Louvers 800A1 is a 24” x 64” Bronze Louver with non-vision inverted “Y” blades. Fa.. The Air Louvers 800A1-J is a 24” x 24” Bronze Louver with non-vision inverted “Y” blades. .. The Air Louvers 800A1-J is a 24” x 60” Bronze Louver with non-vision inverted “Y” blades. .. 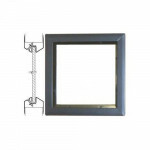 The Air Louvers 1900-A is a 12” x 12” Bronze Louver with adjustable Z-Blade and Fusible Link. .. The Air Louvers 1900-A is an 18” x 12” Bronze Louver with adjustable Z-Blade and Fusible Link. .. The Air Louvers 1900-A is an 18” x 18” Bronze Louver with adjustable Z-Blade and Fusible Link. .. The Air Louvers 1900-A is a 24” x 18” Bronze Louver with adjustable Z-Blade and Fusible Link. .. The Air Louvers 1900-A is a 24” x 24” Bronze Louver with adjustable Z-Blade and Fusible Link. .. The Air Louvers VSL is a 5” x 35” Slimline Vision Lite bronze. Low-profile beveled VISION LITE w.. The Air Louvers VSL is a 6” x 27” Slimline Vision Lite bronze. Low-profile beveled VISION LITE w..